Question from a Reader: What Do You Think of Back Braces? A reader writes: "What do you think of back braces? Which kind, if any, really help?" There are two main types of braces for the lower back: external and internal. An external brace is one you wear and the one that most people think of when they hear the word "brace". An internal brace is the one produced by tightening of certain muscles that surround the spine and of the two, the most important one. Today, I'll explain the external kind of brace. An external back brace can help you feel better and may facilitate healing an injury but I know of no proof that one brace is better than another or even that a back brace, as a treatment, is better than some other treatment (it's just better than no treatment). So, it comes down to what feels good to you, ease of use, and price. During my recovery, I wore a System-Loc brace. The manufacturer claims it provides "hydrostatic lift" - lifting the weight of the abdominal region off the spine and that this is why you feel less pain. I doubt this actually happens since the force due to gravity has not been altered - the "weight" on your spine is the same in or out of the brace. So, why did I wear it? The brace is the tightest fitting brace I am aware of which does two things: makes bending or twisting nearly impossible and slams my brain with all sorts of sensory input (pressure, touch, rubbing, etc). The sensory input competes for attention with the pain impulses and since the brain can only pay attention to one thing at a time, I feel better in the brace. Most external braces though really don't restrict your motion much. They're made of elastic material and Velcro. You wrap it around your abdomen as tightly as you can but you can still move quite a bit. It's possible that having the brace on, along with the sensory input, alters your movement which then reduces stress and strain on the spine. The result is you feel better. If you choose to wear a brace, wear it intermittently and have a plan to get out of it completely. Wearing a brace too often and for too long can weaken tissues such as muscle, tendon, disc, and ligament. And, as soon as possible, start working on your internal brace. This is a brace you "wear" forever and I'll explain that next time. Sometimes, in our quest to prove that everything we do has merit, we fall off the edge of evidence into the stupid abyss. An article in today's Wall Street Journal ("A Treatment Room with A View", section D1) explains how some hospitals, MRI facilities, and out-patient centers have spent millions in re-designing rooms and treatment areas to improve the patient experience. Instead of cold, barren walls and bland colors, some hospitals have added waterfalls, gardens and artwork. I think it's long overdue. But, according to the article, some people argue against spending the money since there's no proof that design decisions have any impact on outcomes. So, a cold, bland, room with barren walls is a better choice? How about if we just use a little common sense instead of spending the money to conduct studies that will show whether or not physical environment influences well being? Do you decorate your home? Paint your house? Wear clean, nifty clothing? Why? Simple. It makes you feel better. Why would it be any different in a hospital? Especially when you already don't feel very good. We don't need a scientific study. We just need to care. A question from a reader regarding the last post on the superman exercise and a similar pose used in yoga. I am a yoga instructor and we commonly do a pose similar to the one below, "superman." The main difference is that the arms are usually pulled behind with hands on the floor, hands clasped or released but pulling back towards the feet with the intention of opening the chest. Does that still cause problems such as compression? Is it the simple process of lifting the legs off the floor that is so problematic or the coupling of the chest rising as well? Thanks for your question. I'll bet there are a few other people with a similar question. 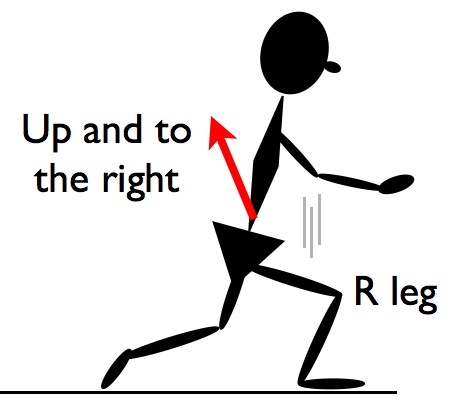 Yes - it is the coupling of the legs and chest motion that creates the compression forces. Some people believe that placing the hands behind the back or head make this a safer exercise but the spinal compression loads are still too high. If you want to learn more about exercises that are spine friendly, I suggest Stuart McGill's textbook. This is one exercise you should never do and if you are doing it, stop. It's commonly referred to as "superman" and is performed widely (the image source is the U.S. Coast Guard) in the armed services, sports teams, and unfortunately, with people who have lower back pain. 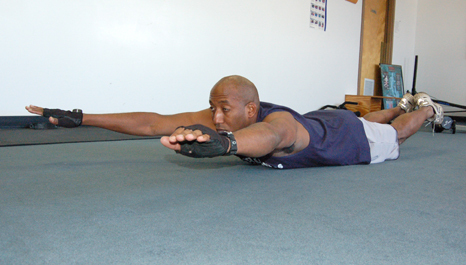 It's regarded as a "core" exercise and used to "strengthen" your back and core muscles. Why am I against it? Two reasons. First, the compression created in your spine by this exercise exceeds 1300 lbs. of force. Anything over about 740 lbs. correlates highly with more lower back injury and pain according to the National Institute for Occupational Safety and Health (NIOSH)). This level of force can damage ligaments, joint surfaces and even rupture your disc. Second, other than Clark Kent, who does this in everyday life? Of course, there is an argument that sometimes you have to perform exercises that are not terribly functional because the muscles are too weak to support the movement or position (e.g. about the only reason people with shoulder pain should consider the "open the coat" or external rotation exercise). So, if you want to challenge your spinal muscles, perform a drill that is not too functional but does strengthen your muscles, and not risk injury to the other tissues in your spine, read this article (another exercise you shouldn't do either). Near the end of the piece, I suggest something you can do easily and safely. Or, you can do the plank or push-ups. Both will strengthen the core muscles and produce safe levels of spinal compression. You might want to print it out and take it with you. We (clinicians) like to compartmentalize process. We like to think of treatments and procedures and sometimes fail to see that the injured, hurting person is not a collection of compartments but a whole being and that being is what needs help; not just his back or his knee or his shoulder. In other words, your back doesn't hurt. You do. And, you need to do a lot of things to put your "self", your whole being, back together. I did at least 54 things to get to my current state of "being". The result? I feel a lot better. In fact, over the past month, I found my self wondering if I actually had an injury. My Oswestry score ( a measure of functional disability due to a spine injury or surgery) is 4% (minimal) compared to over 60% (severe) in March 2008. I know I had an injury, but the pain and misery of the past few months seems very distant. I still am careful though and in particular about seating. Restaurants, meetings, a friend's home may or may not have seating that I feel I can not only be comfortable in but also not injure my self. So, although I feel a lot better, I know I'm not completely recovered. However, the memory of pain has faded (what a great thing that is - once again something I would probably not think of had I designed the human body). When I run into people I know, they always ask, "How are you? How's your back?" and I think they expect me to say, "Well, not so hot really. I blah blah blah......" but when I tell them I feel good, have no symptoms, have put almost everything back into my life, they really seem stunned. Then they ask," What did you do?" and what they're looking for is something simple. But, the answer is I changed my life and it's a change that will be with me forever. I didn't do just one thing: take a pill or, have someone yank and twist my spine or, do one particular exercise. Anyone who tells you that if you just do this _______________(insert technique, surgery, pill, exercise, machine, etc) and that one thing will fix you, is seriously misleading you (you'll see why in a minute). And, there's no shortage of claims running amok over the Internet. If you want to know what I did, you can get an overview by clicking on "Rebuilding DK" under the categories section on the right hand side of the The View. This will sort through all of my writings and return only those related to my injury and recovery. But, some details are missing, I know, so over the next few weeks, I'll be adding more information about the exercise regimen, activity modifications, environmental modifications, medicines, other practitioners and the people who helped me. Bottom line though, I did a lot of stuff. Here's the summary of what I did to avoid surgery and come back from a large L4-5 disc herniation (a sort of table of contents and not in order necessarily) which covers the time period from the injury in February 2008 through July 2008. Future Views will expand on some of these topics and I'm sure there will be more to explain as I move into the next phases of rebuilding. I said, "Ok, I need help. I can't figure this out on my own." Of course, this was after I tried and failed first. I found out what was wrong and why I felt the way I did. I decided what I really wanted (this is actually much harder than it sounds). I was coachable (mostly - you can ask Christine...she'll tell you). I worked on my attitude and it looks like this will be a life-long adventure. I removed sitting from my life ( as much as possible) for over three months. I added spinal decompression (in the form of an inversion table) and used it everyday. I consulted with someone I think of as a "Life Coach" - Dale Goldstein - to help me process the mental and emotional injury. I obtained two surgical opinions. I enlisted the help of a chiropractor, Trish Gregg, who is a member of NUCCA (and Dale said had "healing magic" in her hands). I changed my work environment allowing me to lie down and still use a computer. I did no lifting, twisting, pushing, pulling of anything heavier than about 5 lbs. for nearly four months. I focused on staying well hydrated. When I laid down on the floor, I had found the exact angle for my hips and knees as well as the amount of lumbar support to prevent nerve pain and remained in this position for extended (hours) periods of time. I took pain medication to help me sleep. I took an anti-inflammatory for the first several weeks. I took an oral steroid in the first two weeks to reduce the inflammatory response. I spent time with people who cared about me; who would listen to me but not try to solve my problems or tell me what I ought to do. I tried to get perspective of the magnitude of my problem relative to other people. I wore a special brace nearly all the time including when I slept (at least initially). I spent a lot of mental and emotional energy staying focused on the "now" and not the past or the future. For my rehab program, I started working from the inside out. I had to master the basics like getting my transverse abdominis muscle to work and using exercises to facilitate disc healing. I did not stretch - especially my hamstrings. I mentally worked on letting go of fear: the fear of pain, lack of sleep, weakness, loss of independence. I learned that fear's tactic is to make you believe an illusion, something that has not yet happened, is real and as soon as you buy that lie, you suffer needlessly. I listened to music to help me relax, to inspire me, to sooth me. A lot. I avoided bending first thing in the morning (because disc pressure is already high in the morning) which meant I had to get dressed without bending forward to put on pants or shoes. I got rid of regular shoes and wore shower shoes so i wouldn't have to bend over to tie and untie the shoes. I didn't wear socks for weeks (for the same reason in #31). I was disciplined (well, mostly - except for #35). I used a crutch in the house for the first few steps after sleeping or lying down although I put up a pretty good fuss over it. I didn't cook, go to the grocery store, or clean the house for over three months. When walking was no longer a challenge aerobically, I added Chung Shi shoes to increase my speed so I could increase the physical demand with a mild increase in physical load. I bought a pair of Spira shoes to wear for everyday use to reduce the impact of walking on my spine. I train 6 days a week for three weeks and take a one week recovery cycle. I have follow up tests done regularly to tell me where I am physically and what I need to work on. I read "Emotional Resilience", "Emotionally Free", and "Wherever You Go, There You Are: Mindfulness Meditation in Everyday Life" to help me better understand the emotional elements of healing. I practiced my guitar lying on my back. It made me feel good. I used (and still do) a lower back support in chairs and in cars (this is actually a Zafu - something you sit on while meditating but i use it as a lower back support). I change the pressure of my mattress (a Sleep Number bed) based on how I feel. I use three pillows to sleep: one king size, extra firm, to place between my legs; one regular size, firm, to place in front of my chest; one tempurpedic pillow for my head. I have three work areas: a zero-gravity chair with a special support stand for my Powerbook; one on the downstairs bar so I can sit on the edge of a bar stool; one at a regular desk where I sit on a swiss ball. I work for no more than 45-60 minutes then get up and move around. I sit and stand in meetings. When I sit without a support, I always use the "Cello Pose". I pushed my self too hard more than once but discovered the "edge" and then learned to respect it. I looked at set backs as challenges; not failures (but I wasn't 100% on this...plenty of times my mind would win the negativity war and someone, something would yank me back). I meditated on what I wanted to achieve. I started a gratitude journal. I wrote about the whole process and was as honest as I could be. There may be more things, probably are, but these are the ones I could recognize easily and say with certainty that they made a difference. None of the things on my list were just random choices. I've met and talked with thousands of people over my career with a lower back injury and in nearly every case, their stories have at least one common theme: experimentation. They've tried lots of things: acupuncture, massage, stretching, icing, traction, and the list goes on. When you chase pain, the process can quickly succumb to entropy. Before long, you're ordering some weird, wacky gadget off the Internet and look like Kevin Costner in "Tin Cup" as he tried to fix his golf swing (and some of the things I listed do help people who hurt - no argument from me on that one). I own a particular "lens" through which I view injuries, surgeries and the complaints that often come with them. It's something I developed over my career, understand, and I know it works more often than not to resolve complaints and return people to a higher level of function. It's based on science but is, in many ways, an art form (as all art is the implementation of science). This lens has woven itself into me in such a way that I no longer notice it. It's me and I am it. Nearly everything I look at, I'm looking for the connecting threads. An exercise, a technique, a surgery, an emotional angle, books, movies, music - whatever - I seem to always look for the essentials that form, create or restrict movement. How does this work? How can I use this? Where's the framework? Where's the difference? Similarities? But, it's not the only lens in the world; not the only way to look at injuries and certainly not the only way to deal with pain. I believe you have to have a lens though; something to help guide your decisions. If you don't, then the process turns into just a whole lot of guessing-gobbildygook; trying one thing after another followed by periods of intense frustration and doubt. I can't think of something else, that really works, that is based on such randomness. Well, dating, maybe. No, wrong about that. I take that back. Each thing I did connected to some part of the underlying decision framework. So, rather than just try something, I (or Christine) would first determine if the item fit and how (now, that is not how I first started out in practice...I was much more in the "let's try this today" group). For example, I knew that the herniation was large, posterior and lateral (meaning the protruding disc material had moved to the back and side of the spine). Lying on my back would make this worse as the force of gravity would cause the disc material to slowly seep out since my lower back was unsupported or slightly arched off the floor. The force of gravity would stretch the injured area (imagine how stretching an ankle sprain would feel). But, if I used a support under my back, I could reduce or eliminate the stretch by filling in the space between the lower back and the floor. And to give you an example of how powerful emotion was (and always is) in this whole thing, had I really processed the data, the facts, through my "lens", I would have used crutches or at least one crutch right from the beginning. But, I refused. I refused because I felt it made me look old, weak and made me face my own vulnerability and it was too intense. Of course, all I said, as my lovely bride gently reminded me that help was in the corner, was,"I WILL NOT use a crutch" and then stumbled across the room as if my ankles had been hobbled. So, this is probably enough for now. I have more to share and hope it helps you. Thank you for reading. Thanks to all of you who have sent me good wishes, good vibes, and your comments. It all helped and it's all good. Finally some good news for an unforgiving habit: golf. If you love to play golf, you have a good chance of living five years longer than someone who doesn't play golf. In a recent study published in the Scandinavian Journal of Medicine and Science in Sports*, golfers who played regularly and walked the course had a 40 percent lower death rate. And, the better you play, the lower your mortality. Hmmm....guess I better get back out on the course. Soon. And, unloaded (sub-gravity - see image for example) about 30 lbs. And, I'm tired after 25 minutes of intervals consisting of 60 second jogs at 6 mph followed by a two minute walk but thrilled to be doing it even if it's only about 8 total minutes of jogging. Six months ago, I was on my back unable to do much of anything. Jogging again made me remember just how fit the marathoners are in the upcoming Olympics. The men's world record, held by Haile Gebrselassie, is 2:04:26. Think about that for a minute. That's a running speed of almost 13 miles per hour for over two hours! Our treadmill top speed is 10 mph and trust me, I would be sprinting. Haile and I are really similar though. We both have the same muscles, bones, tendons, ligaments. We both have lungs and a heart. We both pump blood through our bodies and distribute oxygen to our working muscles. But, we have at least one major difference. Haile delivers oxygen to his muscles like Federal Express while my delivery is Pony Express. World class athletes have a very high Max VO2 (the maximum amount of oxygen that can be consumed per unit of time). Haile's max VO2 is likely 75-80 milliliters while mine is probably no more than about 40. And, while some people have a genetic pre-disposition toward higher Max VO2, the main determinant is training. High performance athletes train long and hard to reach the peak levels needed at the Olympics. The good news is that you can boost your max VO2 if you want to by training and if you do, guess what? You also boost your working speed. 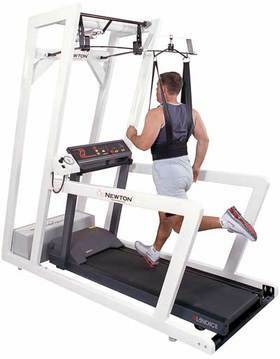 I love that I can jog even though it's one minute and I need an anti-gravity machine to do it safely. I know that if I keep training though, I will one day jog with my buddy Spencer again and that makes me feel like an Olympian. Decide what you really want and then start training for it at the level you CAN train; not at the level you think you SHOULD be able to train or NEED to train. Embrace your current ability no matter how far away you are from where you want to be. That's they key to feeling like an Olympian. I just read the following article by Doug Kelsey and I don’t really understand where to put the rubber band. It just says attach it to your client, but I didn’t know where? Also – it’s for my left knee so I wasn’t sure which side to have the door on. I am so excited to find this article. With my HMO it took almost an entire year of going to the Dr before finding out what the issue was (standard runaround – your knee hurts? Take these! It still hurts? Try the anti-inflammatory AGAIN! Still hurts? Stop bending it!) After finally getting to see a specialist I was given the VMO exercises and I’ve been doing them for 3 months now and NOTHING. I have a toddler and it is so hard to go through life w/out squatting or bending my knee. Thank you so much for any help that you can give me! "......Strengthen all of the quadriceps while in a weight bearing position and your clients will feel much better. How do you do this if weight bearing hurts? The easiest way is to use a strong elastic band. Attach one end of the band to your client and the other end to something very sturdy such as a door. The band should angle upward about forty five degrees. Your client stands sideways to the door (e.g.the band will be pulling to the client's right). Stagger the feet placing the left foot back about twelve inches. Your client now squats through a small range. The band counters the force of gravity while also forcing the quadriceps to stabilize the leg...."
You attach the elastic band to your waist by clipping it onto a waist belt. The other end slips into the door frame using a special strap made just for this (click here and here to see the tools). So, once the elastic strap is attached to you and the door, you stand sideways to the door (in the reader's case, the left side will face the door) and perform a small squatting motion. The arrow in the picture is pointing up and to the right which is for a right knee problem. Since the original post was intended for clinicians, a clinician should first decide if this exercise is appropriate for you. It may not be.